PROS conducted another investigation on 9-26-08. 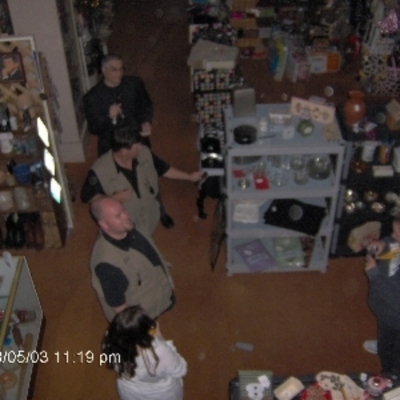 Members of PROS, CRIS and the OKCGC investigated the Old Towne Emporium on Feb. 16, 2007. The PROS Team returned on the 3rd of May 2008 to conduct another overdue investigation of this great place. The team did experience some interesting events during the first investigation led by the PROS Team, as well as the 2nd investigation by PROS. Some of the reports we heard were that of a man seen walking in the upstairs area, who seemed not to enjoy the company of the living.It was also reported that the daughter of the owners, Alicia, had some scary experiences to share with us.We arrived the second time to learn that the activity is said to be at a peak during a new moon or close to one. So we planned this investigation with this information in mind. The team arrived at 8:30p.m. and conducted a walk through. Upon review it was found that over twenty EVPs had been captured by the team within ten minutes! We divided into three different groups. The PROS team includes Ron, Lonny, Jeff our Senior Investigator, Tony our Site Director for the LTRS and his wife Judy, Karen our newest member and trainee and Roberta, Lonny's wife. The owners, Ed and his wife Teresa, along with Alicia decided to be part of our investigation for the night. After posting the teams in the determined locations we began our IRC's for each area. Motion detectors were set up in and around the group locations. It wasn't long before events began to happen. Several times the motion detector located downstairs by the backdoor activated. No visible reason could be found for the activations. The upstairs team heard and experienced some noises which could be just the old building settling, or could it be something else? At one point a door was heard to slam by some of the team members in an area where no one was located. Other unknown sounds were heard by all, and no source could be found for these strange noises. Twice there was what appeared to be kinetic activity. At one point a KII EMF detector flew off a shelf! There were several witnesses to this event. The closest person was several feet away. Two of the witnesses saw the detector fly off the ledge and land several feet away from the shelf. On a different occasion another crew of the PROS Team saw another detector fall forward and the stand fold inward. This could only happen if someone pushed it forward. Prior to this event there was a cold spot felt and something was said to pass the team as this detector collapsed. No one can say for sure what really transpired, however we could see why someone would believe this building to have paranormal activity. The PROS Team plans to return in the future to conduct other investigations at this wonderful location. We would like to thank Ed, Teresa and Alicia for their time and allowing us to conduct our investigation. If you look carefully there is what appears to be a man sitting on the stairs. 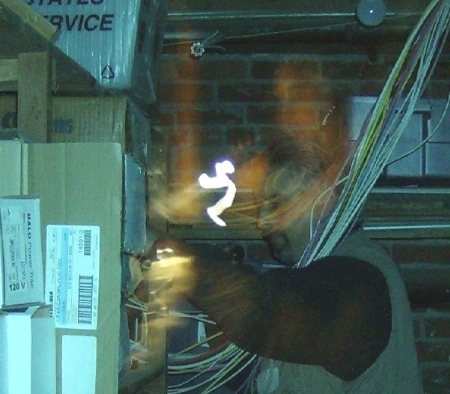 there were no male team members in this area when the person in this photo was captured. We have highlighted the photo so you can see the anomaly clearer. 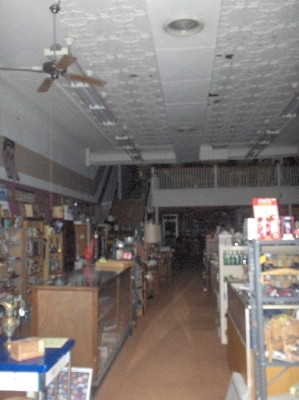 This photo was captured on our first investigation. 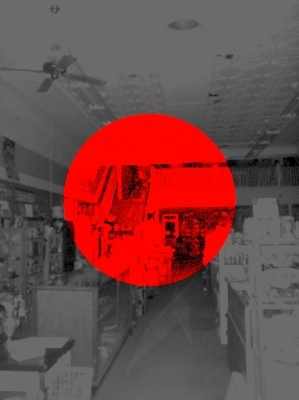 This EVP was captured on the main floor. A male voice possibly says One of the bosses at one time". If you listen carefully he appears to have some type of foreign accent. Captured Feb 16th 2007. A slow male voice says clearly "I don't know Rita". Captured Feb 16th 2007. The EVP above seems to say, "Help me." Captured on May the 3th 2008. This EVP says, "We're nothing." Captured May the 3rd 2008 during our walk through. This picture shows the EMF detector on the floor after if fell (flew) off the white rack just behind it. The event was unexplained by the team... Notice there are some orbs in the picture... Again, using a laser will reveal airborne particles. If you use a bright laser you can see the particles pass through the beam of light... Question every thing!